Designed using leading technology and materials, Drager's range of heavy duty airline apparatus is ideal for use where an extended duration of breathing air is called for. Chemical tank cleaning, toxic spillages or certain tasks when working on offshore installations are all made easier and more comfortable when using the Drager PAS AirPack 1. Uninterrupted air supply is provided by the trolley-mounted cylinder(s) to the wearer via a hose reel. As the AirPack can be easily re-located and therefore positioned in a safe zone which is in close proximity to working area, the user need only wear a lightweight harness, such as Drager's PAS Colt, during operation. This allows the wearer a greater freedom of movement, and less stress and fatigue than they would be subjected to if wearing a conventional self contained breathing apparatus unit. 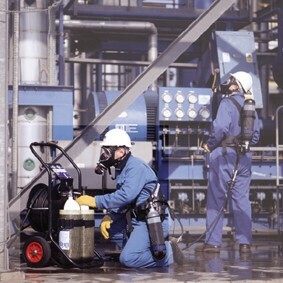 The Drager PAS AirPack 1 is able to accommodate up to four compressed air cylinders of up to 12 litres in capacity and is constructed from an anti-static powder coated steel material. The Drager PAS AirPack 1 benefits from the world renowned, tried and tested, pneumatics system used on Drager's successful PSS range of compressed air breathing apparatus. The system incorporates a safety pressure relief valve and the pressure reducer is shrouded in a protective plate for additional safety. The Airpack has been ergonomically designed to facilitate ease of operation, general handling and mobility. Robust welded durable steel frame coated for corrosion protection with a tough black antistatic polymeric powder coating.